Not recommended for new designs. This product is approaching EOL. Add GPS to your device with the SG Series or SR Series GPS receiver module. They're ideal for applications involving navigation, tracking or surveying. Each module determines its position on the globe by tracking up to 20 satellites at once. Its high sensitivity (up to -159dBm) allows the module to find its position even in dense foliage and urban canyons. Its low power consumption (46mW) helps maximize battery life. The SG Series includes five GPIOs that let you attach input or outputs without using a microcontroller. The SR Series includes an onboard antenna. 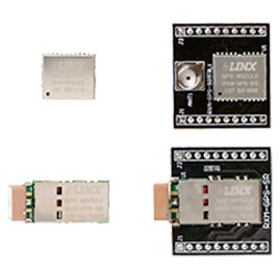 The modules are available alone or mounted on daughter boards. Daughter boards make it simple to use the modules with solderless breadboards. Insert the daughter board pins through breadboard holes for easy hand assembly.